Help a lonely woman meet a nice man. Speak to Fons Beren, Goval Ralen, or Sunel Hlas. Set up a date with the chosen man. Wait a while or head to The Winged Guar (depending on the man). Speak to the man to receive your reward. Speak with Marena Gilnith in the Great Bazaar area who wishes to meet someone new. Agree to hear her story and she'll go on to tell the story of how she ran away to Mournhold in hopes of meeting and marrying a man of her dreams. Unfortunately, she has been unable to make very much money and has had to resort to working all the time to survive, never having a chance to meet any nice, single men. She asks you to keep an eye out of anyone that might be interested in meeting her. From here, you have your pick of the bachelors (or widower): Fons Beren, Goval Ralen, or Sunel Hlas. On the other side of the Great Bazaar you'll meet Fons Beren who claims to male characters that he gets on quite well with the women, but subjects female characters to the kind of lines that cast serious doubt on that claim ("Well, hello there. Aren't you a tasty dish? ", for instance). You can suggest that he meet up with Marena and return to speak with her. She seems hesitant to meet him but eventually agrees to meet up with him. Return to Fons to setup the meeting, and talk to him about Marena again. He will ask how he ought to behave. If you tell him "Try really listening to what she has to say, instead of talking about yourself" the date has a 67% chance of going well. The second option is to tell him "I'm sure she'll like you just the way you are", but that causes the chance of success to 50%. Lastly, telling him "Make sure you list all your past conquests. She'll love that" means there is only a 15% chance the date will go well. Although Marena doesn't mention any detail about the date, they will meet each other outside the Winged Guar two days later. After a couple of hours go back to Great Bazaar to talk to both of the two again to complete the quest. Sadly, Fons won't give you any reward; maybe you should find a better half for Marena. There is another man that will be willing to meet with Marena, Goval Ralen in the Temple District. Just speak to him about women and he'll be ready to go. After arranging the date, talk to him about Marena and he will tell you how nervous he is and ask for advice. If you have at least 200 gold, you can tell him "Take this money, get yourself some new clothes, and stop acting so starry-eyed", then Goval uses the money to buy expensive pants, shoes and shirt, and there is a 67% chance the date will be a success. If you tell him "Be sure you tell her frequently how pretty she is, and how awed you are" the chance of success drops to 50%. Lastly, you can try telling him "Relax. Just go meet her" but this only has a 15% chance of working. 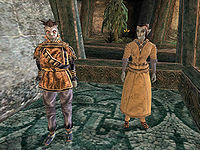 Again, wait for two days and go to the Winged Guar to make sure the two are having their date, back to Great Bazaar after some time, talk to both of them to complete this quest. Goval will give you the Ralen Family Belt as a reward. You can also pair her up with Sunel Hlas, a trader who is mourning and bitter about the loss of his wife in the Great Bazaar. Mention women and Marena to him and he'll agree to a date reluctantly. When you speak to Sunel after setting him up he'll tell you to leave him alone, but if you select the topic Marena Gilnith you should get three options to reply with. If you tell him to be optimistic, there is a 67% chance the date will go well; if you tell him to be himself, the chance drops to 50%, and telling him to talk about his dead wife causes the chance to drop to just 15%. The two will arrange to meet at the Winged Guar, and after some time they will return to Great Bazaar. Depending on the advice you gave (or didn't give) Sunel, the date may end up horribly or very well. If the date went well, you will find Marena upstairs in his shop, and Sunel will reward you with the BiPolar Blade. Make a new save file before you start this quest. It's really easy to mess up this quest because there is a random success factor that may prevent things from turning out well despite your best efforts. The maximum possible chance of success for each of these romances can never rise above 67%. If any of the dates don't work out you get no reward. Gilnith will be very upset and will refuse to talk to you for the rest of the game. The BiPolar Blade can be sold in the Museum of Artifacts for 20,000 gold. If you tell Gilnith you don't have time for her "silliness", she gets upset and her disposition drops 40 points and she'll never speak to you anymore. It seems quest stage 40 cannot be obtained or added to your journal at all (except from console). This has no influence on the quest though. 10 I have met Fons Beren, a pompous man looking for a female companion of sorts. 20 I have met Sunel Hlas, a grumpy storekeeper who no longer has faith in relationships. 30 I have met Goval Ralen, a simple man looking for the ideal woman, but anxious about his chances. 40 I met Marena Gilnith, a practical woman who works in the Great Bazaar. 50 Marena Gilnith asked me to keep an eye out for any interesting, single men I might meet in Mournhold. 60 Marena Gilnith asked me to set up a meeting with Fons Beren for her. 70 Marena Gilnith has asked me to set up a meeting with Sunel Hlas for her. 80 Marena Gilnith has asked me to set up a meeting with Goval Ralen for her. 90 I have arranged a meeting between Marena Gilnith and Fons Beren. 100 I have arranged a meeting between Marena Gilnith and Sunel Hlas. 110 I have arranged a meeting between Marena Gilnith and Goval Ralen. 120 Finishes quest The meeting went well, and Marena Gilnith thanked me for finding her a partner. 150 Finishes quest The meeting went poorly, and Marena Gilnith will no longer speak to me. 200 Finishes quest I have insulted Marena Gilnith, and she will no longer talk to me.